One of the rare and brief bursts of cosmic radio waves that have puzzled astronomers since they were first detected nearly 10 years ago has finally been tied to a source: an older dwarf galaxy more than 3 billion light years from Earth. Fast radio bursts, which flash for just a few milliseconds, created a stir among astronomers because they seemed to be coming from outside our galaxy, which means they would have to be very powerful to be seen from Earth, and because none of those first observed were ever seen again. A repeating burst was discovered in 2012, however, providing an opportunity for a team of researchers to repeatedly monitor its area of the sky with the Karl Jansky Very Large Array in New Mexico and the Arecibo radio dish in Puerto Rico, in hopes of pinpointing its location. Thanks to the development of high-speed data recording and real-time data analysis software by a University of California, Berkeley, astronomer, the VLA last year detected a total of nine bursts over a period of a month, sufficient to locate it within a tenth of an arcsecond. Subsequently, larger European and American radio interferometer arrays pinpointed it to within one-hundredth of an arcsecond, within a region about 100 light years in diameter. Deep imaging of that region by the Gemini North Telescope in Hawaii turned up an optically faint dwarf galaxy that the VLA subsequently discovered also continuously emits low-level radio waves, typical of a galaxy with an active nucleus perhaps indicative of a central supermassive black hole. The galaxy has a low abundance of elements other than hydrogen and helium, suggestive of a galaxy that formed during the universe's middle age. The origin of a fast radio burst in this type of dwarf galaxy suggests a connection to other energetic events that occur in similar dwarf galaxies, said co-author and UC Berkeley astronomer Casey Law, who led development of the data-acquisition system and created the analysis software to search for rapid, one-off bursts. Extremely bright exploding stars, called superluminous supernovae, and long gamma ray bursts also occur in this type of galaxy, he noted, and both are hypothesized to be associated with massive, highly magnetic and rapidly rotating neutron stars called magnetars. Neutron stars are dense, compact objects created in supernova explosions, seen mostly as pulsars, because they emit periodic radio pulses as they spin. "All these threads point to the idea that in this environment, something generates these magnetars," Law said. 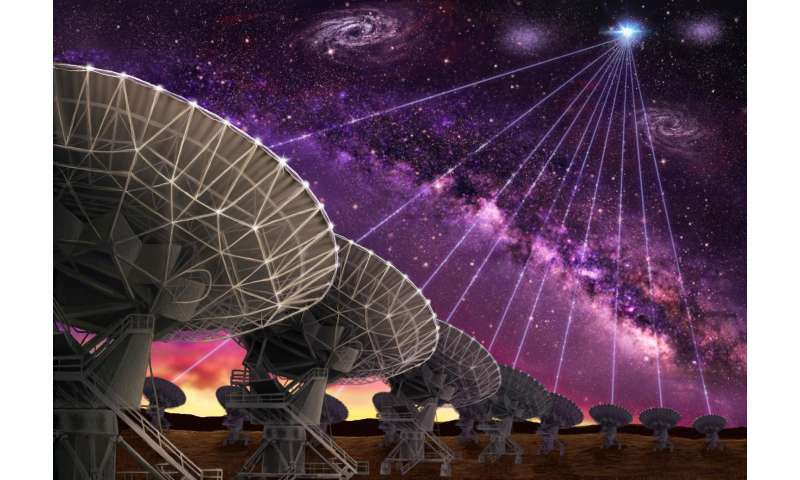 "It could be created by a superluminous supernova or a long gamma ray burst, and then later on, as it evolves and its rotation slows down a bit, it produces these fast radio bursts as well as continuous radio emission powered by that spindown. Later on in life, it looks like the magnetars we see in our galaxy, which have extremely strong magnetic fields but rotate more like ordinary pulsars." In that interpretation, he said, fast radio bursts are like the tantrums of a toddler. This is only one theory, however. There are many others, though the new data rule out several suggested explanations for the source of these bursts. "We are the first to show that this is a cosmological phenomenon. It's not something in our backyard. And we are the first to see where this thing is happening, in this little galaxy, which I think is a surprise," Law said. "Now our objective is to figure out why that happens." Law, team leader Shami Chatterjee of Cornell University and other astronomers on the team will present their findings today at the American Astronomical Society meeting in Grapevine, Texas, in the scientific journal Nature, and in two companion papers to appear in the Astrophysical Journal Letters. Fast radio bursts are highly-energetic - though not energetic enough to blow a star apart - and very short-lived, lasting one to five milliseconds. These bursts of radio waves have remained a mystery since the first one was discovered in 2007 by researchers scouring archived data from Australia's Parkes Radio Telescope in search of new pulsars. The burst they found occurred in 2001. There now are 18 known fast radio bursts, all discovered using single-dish radio telescopes that are unable to pinpoint the object's location with sufficient precision to allow other observatories to identify its host environment or to find it at other wavelengths. The first and only known repeating burst, named FRB 121102, was discovered in the constellation Auriga in November of 2012 at the Arecibo Observatory in Puerto Rico, and has recurred numerous times. Law has been working for the past few years on methods to quickly find transient radio bursts like these, which require collecting about one terabyte of data every hour. At the VLA, he currently uses 24 computer central processing units (CPUs) in parallel, both to record and search the data for brief radio bursts. "The overall theme, first with the Allen Telescope Array and now with the VLA, is to use these interferometers as high-speed cameras, taking the sensitive imaging capabilty of the telescope, cranking up the data rate and improving our algorithms to get access to these millisecond time-scale transients," he said. "We really pushed hard to capture this terabyte-per-hour datastream reliably and set up a real-time platform for extracting these very faint fast bursts from that massive datastream." The first burst was found in the data just a few hours after it was recorded on Aug. 23, Law said. "We observed for about 40 hours earlier last year and saw nothing," he said. "Then we started a new campaign in the fall of 2016, and in our first observation we saw one. Then we observed for another 40 hours or so and saw eight more bursts. So this thing just suddenly turned on." Law hopes soon to switch to 64 dedicated and more powerful GPUs - graphics processing units - so that real-time analysis is possible. While Law has his pet hypothesis about the origin of fast radio bursts - a magnetar surrounded by either material ejected by a supernova explosion or material ejected by a resulting pulsar - there are other possibilities. One alternative is the galaxy's active nucleus, with radio emission coming from jets of material emitted from the region surrounding a supermassive black hole. The source of the fast radio burst is within 100 light years of the continuous radio emissions from the core of the galaxy, suggesting they are the same or physically associated with one another. Other members of the team are the National Radio Astronomy Observatory, a facility of the National Science Foundation operated under a cooperative agreement by Associated Universities, Inc.; West Virginia University; McGill University in Montreal, Canada; and the Netherlands Institute for Radio Astronomy. The problem with the numerous assumptions that allows them to arrive at their conclusions is they are based entirely on ignorance. The plasma ignoramuses are searching for resolution to a mystery yet fail to remove the blinders that only requires mass to produce these events. A return to basic plasma physics would do them well. Hey what do you expect. Most astronomers do little more than play most of their lives doing things that serve no real purpose but are nevertheless extremely entertaining and fulfilling for them personally. Almost none of them are expected to produce results that will affect life on Earth in any way other than theoretically, and that suits them perfectly. It allows them to assume endlessly justifying their own reasons to be in order to maintain a steady flow of funds to keep them busy having a great time.